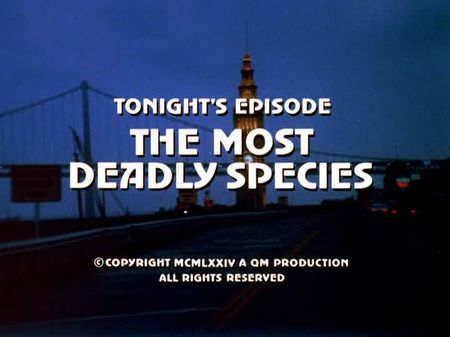 The screencaps for The Most Deadly Species were added to the episodes' page. Murray Brennan, a syndicate boss of San Francisco's underworld and an 'old acquaintance' of Mike Stone, seeks revenge after his son and successor was kidnapped and killed. Mike and Steve are investigating the case, while Steve is seduced by his new and attractive neighbour. Mike already hears wedding bells ringing; however, little do our two cops know that the beauty is a hit-woman who is gaining valuable intelligence from love-struck Steve for her assignment. When the suspected murderer of Brennan's son is found dead, Mike entertains some doubt. His instinct as well as crime lab techniques finally reveal the truth behind Steve's latest romance. This episode starts at famous Candlestick Park, home to the San Francisco Giants as well as the 49ers back then, and just demolished in the first half of 2015. The following chase between the kidnappers and young Brennan's bodyguard leads them to an adjacent scrap yard where the bodyguard is killed. Syndicate boss Murray Brennan's mansion is located in the Pacific Heights district, and his son is found dead in a funeral home in the Mission district. We are also taken to Telegraph Hill - to the house of Steve's and Sydney's apartments, precisely - and back to the southern part of Mission district where Murray Brennan meets hit-woman Sydney in the old St. Anthony of Padua church (which was demolished after a severe fire just a year later). Sydney kills kidnapper Lloyd Davies in 'The Connection' bar, located in Noe Valley. Mike and Steve interrogate injured mortician Marioni at Davies Medical Center in the Duboce Triangle, whereas this episode's climax takes us to the Palace of Fine Arts.